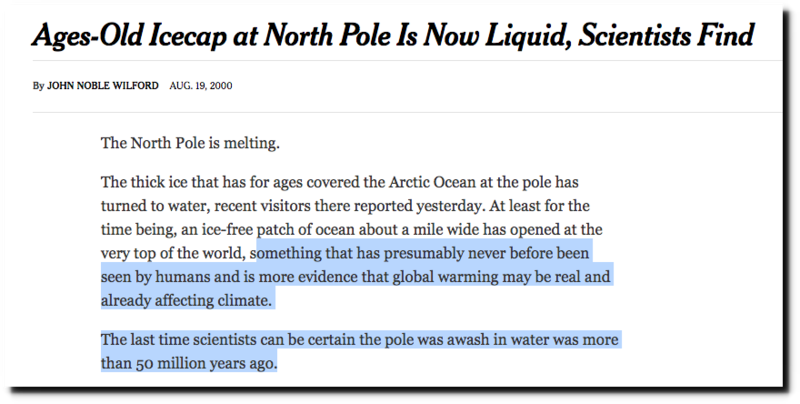 I regularly document how the New York Times blatantly misinforms their readers about climate. They are getting just as desperate with their attempt to overthrow the president, accusing him of divulging classified information to the Russians. 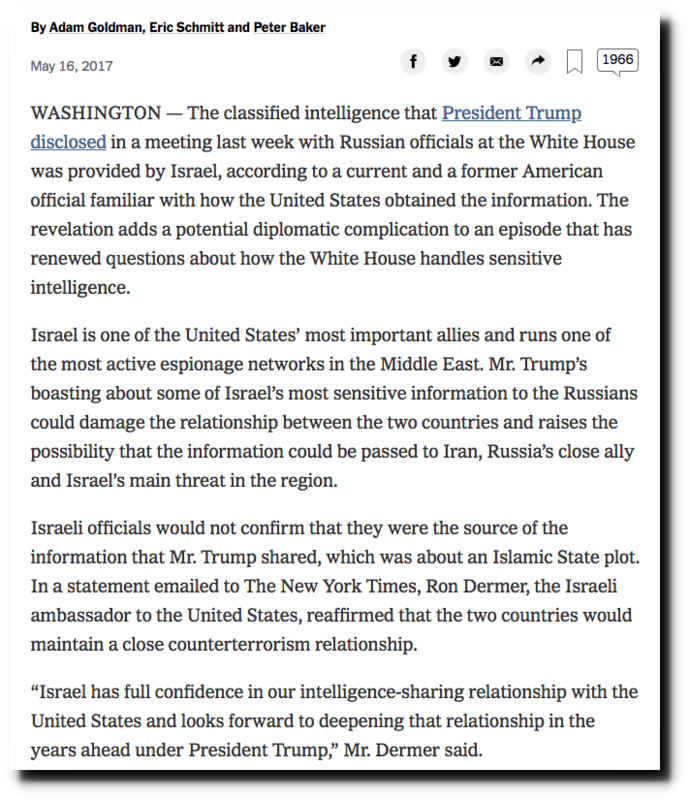 The information was about an ISIS plot, and the New York Times cited an anonymous (of course) official as saying it could damage US/Israeli relations. There was nothing inappropriate about what the president did, and he has the best relations with Israel of any president. The claim above “divulged classified intelligence to Russians in the Oval Office” is just another desperate smear attempt. Then the New York Times article makes Rosenstein look like an innocent victim of his own anti-Comey memo, saying “he feared he had been used.” This is the exact opposite of what occurred. Rosenstein prepared the memo to set up the president, get Comey fired, and then use it as the excuse to appoint Mueller. I don’t know what they are worried about though. 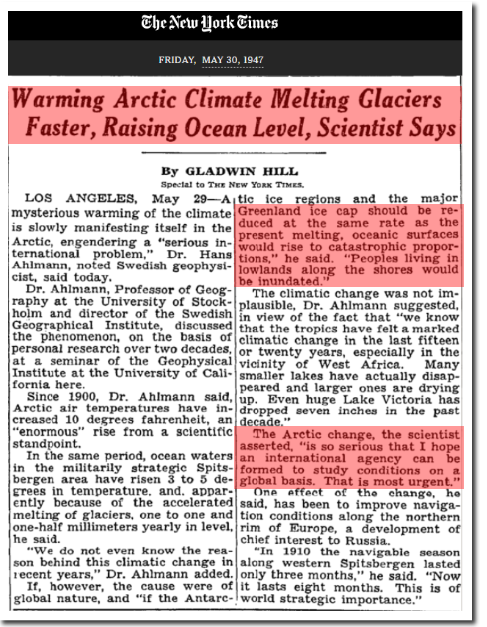 According to the New York Times, Manhattan drowned 70 years ago, and the North Pole has been ice-free for almost 20 years. The message is quite clear , thank you Tony . Trump nowadays has faced more intrigues than Louis Quatorze ,but he lacked at least 16 secret service oganisations . I’m ignorant about your reference. Interesting thought: Trump has enough money to hire his own; why not? Then again, where can he be sure to find anyone he can trust to act in his interest? Maybe he needs a multilayer private investigatory system…NOT managed by Kuchner. I wonder whether Trump’s poor selection of advisors is related to a tendency to delegate responsibilities. In this case particular, he’d need to get hands on and do it himself. Trump had his own security and intelligence people before he got into politics. Just replace “Soviets” with “Progressives” and you won’t be far off. There is not doubt and I’m confident the real depths collusion and conspiracy is going to be exposed in a way that it never has before as long as Republicans can hold their majorities. 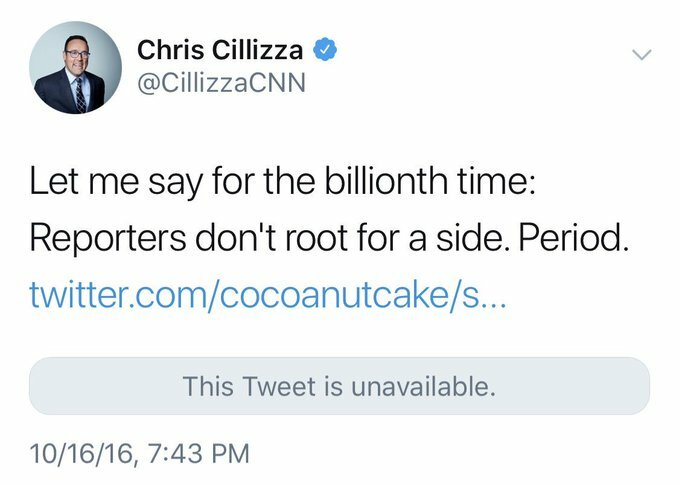 Chris Sleazza is as partisan is it gets. I remember reading his dishonest, side-rooting stench in WaPo before he slimed on over to CNN. And yet many were cheering when they thought the Hildebeast would win, and then crying and mourning when they learned that she was Trumped. If they don’t root for the reporters side, they’re in a bunch of trouble..
that Trump supports lose in November. or at least anger him. And people still DEVOUR the NYT every day, word-by-word, like it’s the Rosetta stone. And people devour alcohol, meth, and opioids every day. Junkies need their junk. And liberals need their Trump lies. Why fire RodRo? He’s a rat lookng for a place to rest. He may resign with pension intact, meh. I am sure he will soon evince total loyalty to The Stable Genius and try to live out his days in peace. I am convinced that Hurricaine Donald is forming right now off the coast of Africa and is bringing a shyte-storm to the mid Atlantic seaboard this month of October. The declassifications combined with patriots filling parking lots outside SRO Trump rallies in red states with blue senators is a perfect storm for our enemies. “When you strike at a king you must kill him.” They failed in this, called down the thunder and now they got it. Texas’ 19the Senate district, blue for more than 100 years, 73% black and hispanic, won by Pete Flores (R). And it wasn’t really close. We will soon be listening to the lamentations of our enemies. Cruz is reportedly having a time of it, though. Comment? 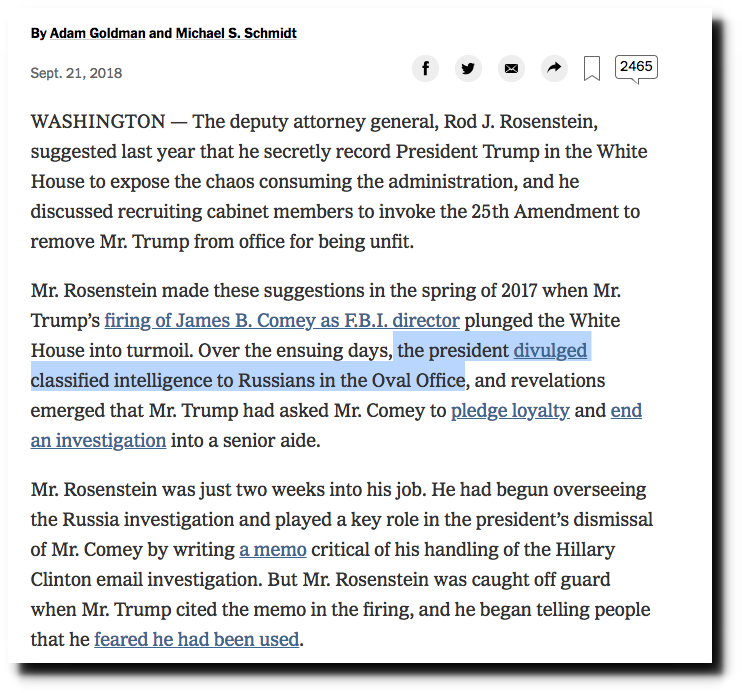 The New York Times would love to create a “crisis” whereby Trump is accused of meddling with the Mueller investigation by firing Rosenstein. Especially just before the election. Two principles to remember. Who benefits, and follow the money. Um, didn’t anyone notice that the President has the RIGHT to decide when divulging classified material is in the national interest? Don’t like it? Too bad. The “estimate” that Russia has “interfered” with our elections sure has got some great mileage. The Russophobic innuendo has weakened Trump, shattered any chance of rapprochement with Russia, and the imperial sanctions policies against Russian goods are destroying diplomatic relations with China and India. All on innuendo. I’m still waiting for the Concord Management vs. Mueller dispute to come to a head. It’s put Trump in a box, to the point where Brennan can shamelessly accuse Trump of treason for meeting with Putin, and no one bats an aye. Trump should just make CAGW a classified matter that can’t be divulged and that would be the end of it. Trump delaying release at behest of 2 foreign governments. Presume Australia protecting the fishnet stockings Alexander Downer and either Great Britain or Israel as both involved in setting up Papadopoulos sting. Funny that no one cares who the two countries are and more importantly why they were so scared at the release of the documents to make such an extraordinary request.